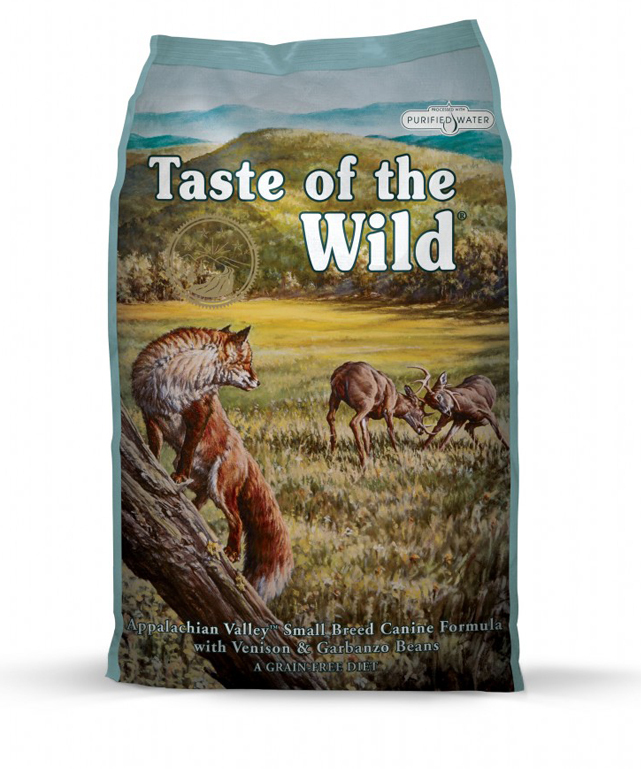 Taste of the Wild Appalachian Valley Small Breed Recipe is formulated to meet the nutritional levels established by the AAFCO Dog Food Nutrient Profiles for maintenance. Species Specific Probiotics – Healthy digestive and immune systems are vital to the overall health of your pet. Our proprietary K9 Strain Probiotics are developed specifically for dogs and added after the cooking process to ensure viability. Each pound of Taste of the Wild provides 80 million live, active cultures that help support healthy digestive and immune systems. Ingredients - Venison (10%), lamb meal, garbanzo beans (10%), peas, lentils, pea protein, canola oil, egg product, duck meal, pea flour, tomato pomace, ocean fish meal, minerals, dried chicory root, tomatoes, blueberries, raspberries, yucca schidigera extract.